Stuttgart, Germany, September 25, 2013 – German video IP and solution provider videantis today at the Ethernet & IP @ Automotive Technology Day announced a new video codec specifically optimized for automotive applications. The codec implements the H.264 High 4:4:4 Intra Profile, has very low encoding and decoding delay, and supports 8, 10 or 12-bit samples for higher-dynamic-range video. The codec is available for videantis’ v-MP4000HDX processor architecture, which can be licensed from videantis for inclusion into SOC (system on chip) designs. The videantis H.264 High 4:4:4 Intra codec enables compression with virtually no loss of quality, which is of particular importance for safety-relevant automotive vision algorithms that are subsequently performed on the decompressed video signals transmitted over Ethernet AVB. Coding artefacts in any way cannot impact these algorithms or the safety systems won’t work well. The automotive industry is quickly adopting the Ethernet Audio Video Bridging (AVB) standard for video distribution inside the car. This standard enables the replacement of expensive analog coax or LVDS cables with low-cost, unshielded twisted pair cables. In order to adopt Ethernet AVB-based cabling, video needs to be compressed at the camera and decompressed at the central unit. It’s important this additional compression step does not reduce the video quality, and does not introduce any video delay. The videantis H.264 High 4:4:4 Intra Profile codec allows for extremely high quality, 10-bit or 12-bit samples for higher dynamic range, a bitrate of up to 150Mb/s and 1080p30 Full HD resolution. The codec can be integrated into an SOC that does not require external DRAM memory, reducing cost further. In addition, the low-delay, high-dynamic-range video codec can be combined with computer vision-based safety algorithms that run on the same v-MP4000HDX processor architecture. For interoperation with central unit systems that don’t support H.264, there’s support for 10-bit or 12-bit M-JPEG. The codec runs on the low-power, scalable v-MP4000HDX processor architecture. This multi-core architecture is very low power, area efficient, and easy to integrate into an SOC. In 40nm LP technology, for example, at 1080p30 resolution, the H.264 High 4:4:4 Intra decoder consumes only 27mW on a silicon area of only 1.2mm2, while the encoder consumes only 37mW on 2mm2. The architecture internally uses single-ported SRAMs only, easing implementation with automotive-qualified memory libraries. The H.264 High Intra encoder, decoder as well as M-JPEG do not require external DRAM. In contrast to fixed-function logic, the processor-based architecture eases system integration since software can be adjusted to interoperate with the rest of the system including encoder and decoder chips from multiple vendors. The software-based rate-control algorithm can easily be tuned to specific working conditions for robust operation in the final system. 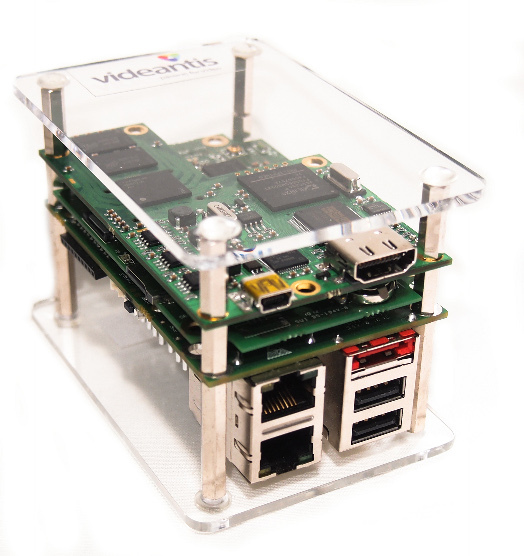 The videantis v-MP4000HDX processors support a wide range of codecs, including H.264/AVC with MVC, Google’s VP8, VP6, MPEG-4 SP/ASP, RealVideo 8/9/10, DivX, XviD, H.263, Flash (Sorenson), WMV-9/VC-1, MPEG-2, MPEG-1, JPEG, and MJPEG. The v-MP4000HDX can be firmware upgraded to run H.265/HEVC or VP9. The H.264 High 4:4:4 Intra Profile video codec, v-MP4000HDX processor IP core, optimized OpenCV library and suite of additional video codecs are now available for licensing. A development and evaluation system is available that includes a 40nm implementation of the v-MP4280HDX processor at 400MHz, a 1GHz ARM host CPU, camera input, HDMI output and networking.